The aircraft was manned by a composite crew of two 99th Bomb Wing Standardization Division crews and two instructors from the 39th Bomb Wing at Walker AFB NM. The Mission was familiarization with low level "Advanced Capability Radar" (ACR) penetration techniques designed to deal with the newest Soviet air defense radar systems. A six hour briefing was held the previous day, and the crew was given the choice of two "Poker Deck" training routes, one in the Carolinas and one over Maine. While ACR training flights had been made over west coast "Poker Deck" routes, this was to be the first such flight, utilizing terrain following radar, in the eastern U.S.
Takeoff was at noon with an ETA back at Westover of 5:30 PM. After an hour and twenty five minutes of local area flying to calibrate equipment, updated weather was received for the two Poker Deck routes. The Northern route in Maine was chosen. This route would have the B-52C begin its low level simulated penetration of enemy airspace just south of Princeton, near West Grand Lake, fly north, near Millinocket and then through the mountains in the Jo-Mary/Greenville area. The aircraft would then turn northeast near Seboomook Lake, then southeast near Caucomgomic Lake,and through the mountains of northern Baxter State Park. After crossing Traveler Mountain, the aircraft would climb back to altitude over the Houlton VOR Station. About 2:30 PM the aircraft arrived over the Princeton ME VOR and descended to 500' to begin its simulated penetration of enemy airspace. About 22 minutes later, just after passing Brownville Junction, and while trying to climb above turbulance, the aircraft suffered a structural failure. The verticle stabilizer broke free, sending the aircraft into an uncontrollable right turn, nose down. Lt.Col. 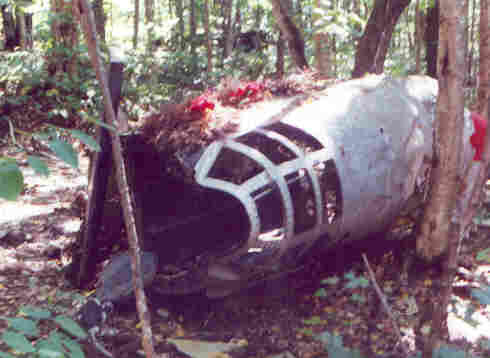 Dante Bulli, the Aircraft Commander, ordered the aircraft abandoned. The aircraft impacted the west side of Elephant Mountain, six miles from the Town of Greenville. The final turn and black smoke cloud after impact was witnessed by a grader operator on a remote woods road, but the area of the crash was initially thought to be south and east of where it actually was so search aircraft initially on scene before dark were unable to locate it. The temperature dropped to a low of nearly 30 below overnight. Only the 3 men in the upward firing ejection seats were able to leave the aircraft before impact. The Copilot was fatally injured when he struck a tree. When the site was located and Pararescue men were lowered to the scene 20 hours later, only two were located alive. Col. Bulli landed in a tree and spent the night in his survival kit sleeping bag atop his life raft. Captain Gerald Adler, a Navigator flying in the Electronic Warfare Officer's position, struck the snow covered ground before separating from his ejection seat. Unable to get his survival kit from the bent seat, and seriously injured, he survived the night by wrappng up in his parachute. 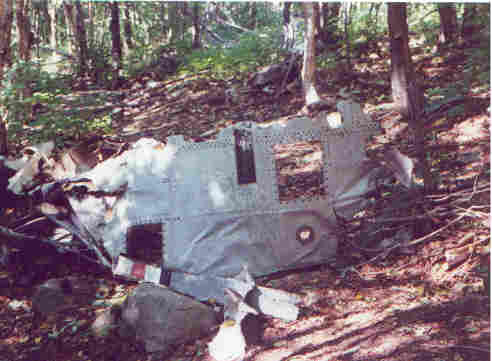 Killed in this accident were: Major Robert Morrison, an Instructor Pilot flying as Copilot; Major Robert Hill, Radar Navigator; Captain Herbert Hanson, Navigator; Captain Charles Leuchter, a Radar Navigator; Lt. Col. Joe Simpson, Instructor Pilot; Major William Gabriel, Instructor Navigator; and TSgt. Michael O'Keefe, Gunner. This aircraft was the second of four of the "high tailed" B-52s to suffer a structural failure at station 1655 due to buffeting stresses during turbulance, all with fatal results. This hazard was amplified when the B-52s transitioned from high altitude to low altitude bombing missions. 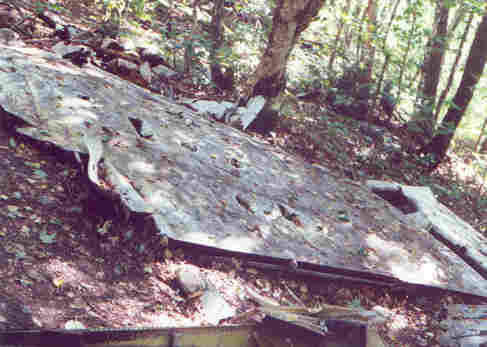 After the fourth accident, almost exactly one year later, this area of the structure was reinforced throughout the B-52 fleet. Two sections of the right wing. Note part of an Air Force insignia on the sliver in the foreground of the right photo. The Gunner's compartment is the largest recognizable piece of the fuselage. 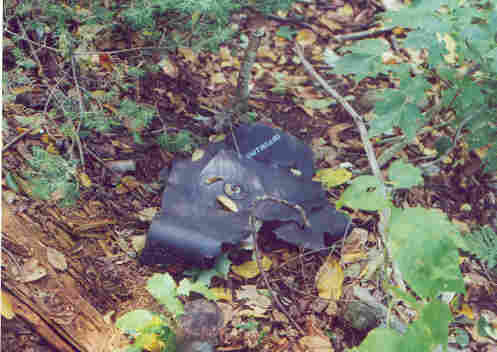 A piece of a rubber fuel bladder cell from the left wing.